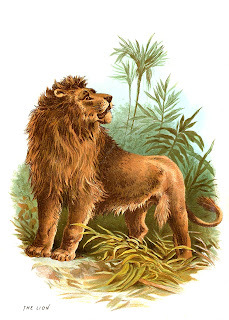 What I love most about this piece of animal clip art are the colors. The teals, aquas, and peaches together are so lovely. But, of course, the majestic lion is spectacular! This was an interesting little piece of ephemera, a Victorian scrap card, I found tucked away in an old book. I think it must have been used as a bookmark. I hope you enjoy!